Are you ready to invest in your confidence and oral health with a straight smile? That is great! To start your journey, you are considering Invisalign in Herndon. You want a discreet and convenient treatment, which is why you are interested in the clear aligners. Did you know that there are also added benefits for your lifestyle when choosing them? With Invisalign, you will enjoy less restrictions and an easier treatment when compared to traditional braces. When starting your treatment, you look forward to getting a flawless, beautiful smile; however, there is one issue standing in your way—tooth discoloration. If stains have caused your teeth to turn yellow or brown, you can get a bright white smile while using Invisalign. Since the aligners are removable, you can still benefit from a whitening treatment while you are correcting the alignment of your teeth. Although metal braces are effective, they do come with dietary restrictions. Not with Invisalign. The aligners are removable, so you can still eat and drink what ever you like; however, be sure to remove them before eating or drinking anything except water. It is also encouraged to drink more water while wearing your aligners to prevent them from staining to maintain their translucent appearance. When choosing Invisalign, brushing and flossing your teeth is easy because there are no brackets or wires to clean around. While your oral hygiene habits will remain unchanged, your daily routine will take a little longer than usual because you must clean the aligners. Use a clear anti-bacteria soap and soft-bristled toothbrush to clean them twice a day. This will prevent them from staining while reducing odor-causing bacteria. In addition, you will want to rinse your aligners before you place them back into your mouth, like after you eat lunch. Often, it is believed that orthodontic treatments are only for children and teens, but that is not true. Now, more adults that ever are choosing to correct the alignment of their teeth. In fact, 16% of orthodontic patients are now over the age of 18. The large increase is due to less noticeable treatment options, like Invisalign. If you feel you are too old for braces, do not worry. You are never too old to get a straight smile with the clear aligners. If you are ready to invest in yourself, it is time to schedule a consultation for Invisalign with your dentist in Herndon. About Premier Dental Care P.C. Premier Dental Care P.C. is a leader in the community for comprehensive dental care. In addition to general dentistry, they also provide many areas of specialized services, like orthodontics. 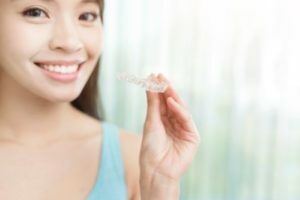 If you are ready to see if Invisalign is right for you, contact your trusted cosmetic dentist in Herndon today to schedule your consultation for a straight smile.